Save for a couple of tweaks here and there, not much has changed with the Finest brand in several years. 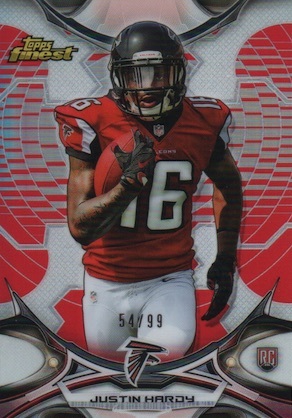 Refractors, color designs and autographs are all still the main parts of the 2015 Topps Finest Football mix. Once again packaged as a pair of mini boxes, each hobby box has a Rookie Autograph Patch and an Autographed Jumbo Relic. The biggest change is actually based on something old -- 1995 Finest inserts. 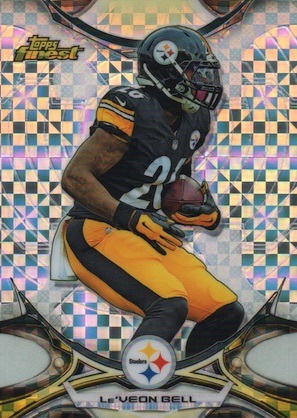 Printed on Chrome-style stock, the 2015 Topps Finest Football base set has 150 cards. Refractor parallels are plentiful. Basic versions are 1:3 packs while X-Fractors are 1:6 packs. 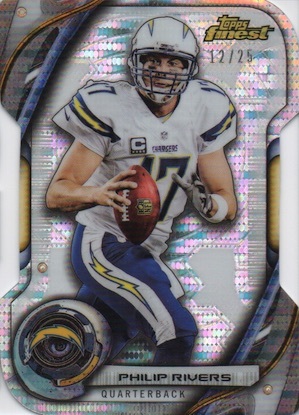 Serial-numbered Refractors come in Blue, Gold, Red, Diamond, BCA Pink (#/25), STS Camo (#/10) and Superfractor (1/1). Each card also has four different one-of-one Printing Plates. The one-per-box Rookie Refractor Autograph Patch cards use sticker signatures and pieces of player-worn jerseys. Numbered parallels come in several colors and patterns. 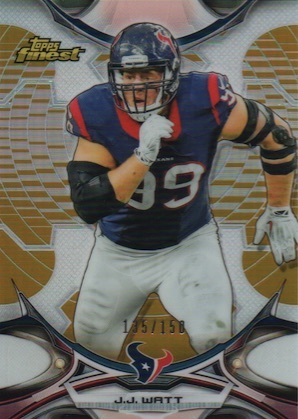 Among them are new Diamond Refractors. On the rare side are Superfractors (1/1) that have a piece of a team patch and four different one-of-one Red Refractors. Each of the Red Refractors has a different type of recognizable swatch: Pigskin NFL Shield, NFL Shield, Jersey Swoosh and Swoosh. Autographed Jumbo Relic Refractors also use stickers for the signatures. The checklist has a mix of rookies and veterans. These have a total of nine different Refractor parallels, all of which are series numbered. 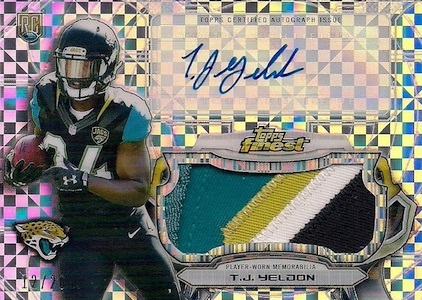 2015 Topps Finest Football also has Dual (#/10), Triple (#/10) and Quad Book (#/5) Autograph Patch cards randomly inserted. Not all autographs come with relics. Rookie Refractor Autograph Variations use the same design as the base set only with different photos. Signatures here are on-card. A 20-year-old design returns with 1995 Finest Rookie Refractors. 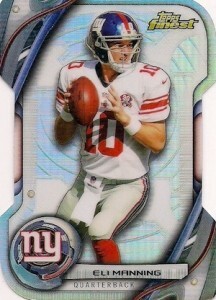 These are inserted one per mini box and have Blue, Gold, Red, Pulsar and Superfractor (1/1) parallels. The design is also used for 1995 Finest Refractor Autographs (#/20). Signers are a mix of veterans, rookies and retired players. Each mini box has a pair of Finest Atomic Refractor Rookie Die-Cut inserts. These have five parallels. Select players also have autographed versions. 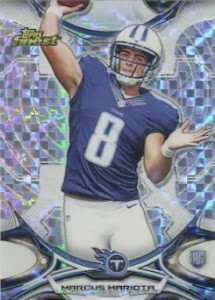 Opting for rarity, QB Cuts are case hits. Spotlighting top play callers, the inserts come with a die-cut design. 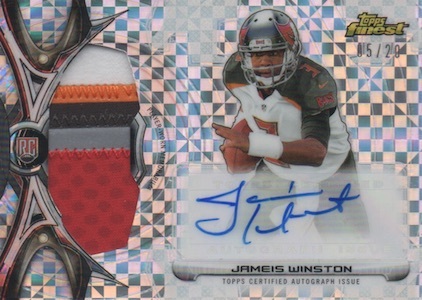 Every eighth case of 2015 Topps Finest Football includes a hot box. All of the base cards in these are replaced by Black Refractors. This is the only place to find the parallels. *Hot Boxes - 1:8 cases; every base card is a Black Refractor. 40 cards. 1 per master box. 25 cards. 1 per mini box. 40 cards. 2 per mini box. 45 cards. 1 per master box. Good: Two autograph relics per box, base autograph variations are on-card, 1995 inserts. Bad: Same old Finest, too much reliance on die-cuts, bullseye design not as appealing as previous years. The Bottom Line: Finest is largely a constant. If you like the more recent editions, this one should continue to draw you in. But if you are not a fan, this release is unlikely to convert you. The return to on-card base autographs for rookies is a big plus. While it is not as simple as the 2014 design, the 2015 design comes across a little disorienting based on the circular background design. 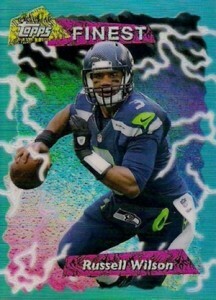 This goes even further with the colored Refractor parallels. It certainly does not ruin the product and is more of a personal preference, but I just found it took away from the overall look. 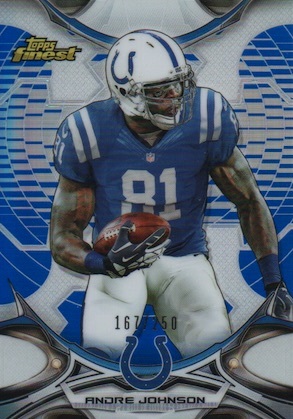 When I think of Topps Finest, I think of bold designs and innovation. When it comes to the inserts, that could not be further from the truth. The die-cuts, man. You know what Finest needs? The same boring die-cuts. 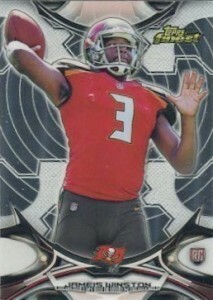 Expect to find several in each box with the standard Atomic Refractor Rookies joined by QB Cuts, which is essentially just a die-cut base card. Although featuring old designs is hardly a new concept in the hobby, 1995 Finest is certainly a fun choice. 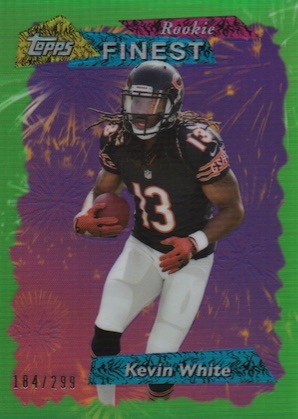 Bright, loud, bold and nostalgic, the insert may not work for all collectors, but I found it refreshing. I would much rather have pulled 2-3 of these in my box versus the five die-cuts I accumulated. I do think I was supposed to pull at least two, but only ended up with one of the 1995 inserts. While stickers are the norm in Finest, the transition back to on-card autographs in limited fashion is a very nice feature. Make no mistake, these are considerably more rare than the other signed cards and offer a much smaller checklist, but the difference is huge. Dropping two per box, the autographed relics feature two main designs. I actually pulled two Jumbo versions, including a nice patch, but it is still hard to get very excited about event-worn jerseys and sticker autographs. I realize this is a problem with the hobby as a whole, but at some point it has to become an issue that is addressed. The checklist largely meets expectations and the only real criticism could be that the on-card subjects are more limited. Still, nearly all the big rookie names are covered, so there is not much of an issue here. I imagine most veteran collectors don’t look to Finest as a key choice but non-rookie autograph content is almost completely removed. Time and time again, sticker autographs and event-worn relics don’t offer the same value as the on-card options. While there is a shot at the limited hard-signed autographs, which does boost value, many collectors busting by the box won’t come across one. Also helping the value is the brand power, the many Refractor parallels and the potential for the handful of multi-player autographed relics. At about $90-100 per box for 12 packs and two autographed relics guaranteed, Finest is a gamble, but still easier to stomach that other products. 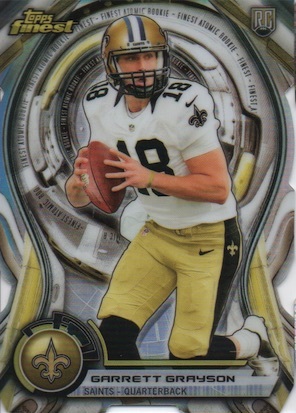 2015 Topps Finest Football is a busier version of Topps Chrome and, for me, that makes for an enjoyable experience. Outside of my annoyance at the die-cut fixation, I thought it was a fun break. The color was moderate but not overdone, the break felt like it went long enough without becoming stale, and the bright colors and bold designs caught my eye, even if it was just for a moment. 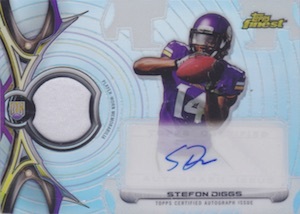 Plus, pulling a low-numbered autograph for a top rookie is always a nice experience. 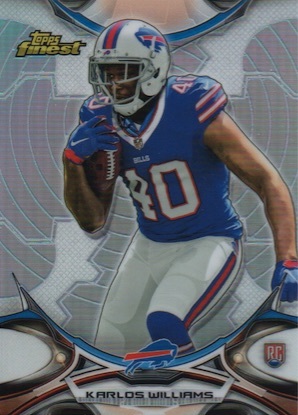 Like all of the Topps Football products, the future is very uncertain and this could mark the end of the product as we know it. To that point, Finest did not really go out like I would have hoped, but who knows how things will play out in the future. 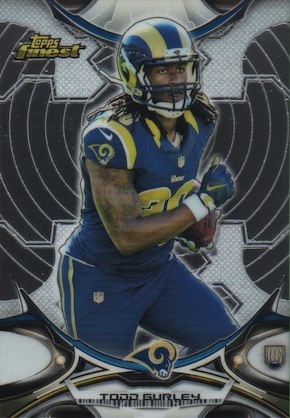 Todd Gurley 2015 Topps Finest Jumbo Pink RC Rookie Patch Auto 6 10! Rams! 2015 Topps Finest Jay Ajayi Auto 3 Color Player Worn Patch Rc MINT! 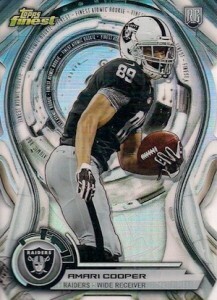 I’ve been buying cards my whole life, Finest to me is comparable to Chrome! Only with more jersey cards. Love finest! Mark � I noticed that too. I contacted Topps and will pass along anything I hear back. Mark � Yeah, it is odd to release the checklist, then immediately push the product date back a week. The fact the checklist is out is at least a good sign. Jumbo jersey auto Brett Hunley.all green.. sure he’s gonna get a chance to play behind Aaron Rodgers..not.. Overall I feel this is a good value. 4 Box Break Yielded a total of 9 AUTOS and tons of Serialized cards. Cooper Pulsar RPA 2 CLR Patch AUTO /35, Stefon Diggs Refractor Patch AUTO, Sammie Coates Jumbo AUTO, Jamison Crowder PAtch AUTO /99, Phillip Dorsett GOLD Refractor Patch AUTO /99 and others..Multiple Base and Refractor RC of Gurley, Winston, Cooper, Mariota etc. Many gradeable cards if thats your thing. With some new inserts and styles !! Finest is a product I always come back to. Sharp looking cards. Opened 2 boxes and did great. QBC Die-cut Red refractor Matiota, Gold Peyton Manning 95 reprint, STS rookie Parker/10, STS auto patch Hardy/15, BCA auto patch Mayle /10, diamond auto jumbo relic Kevin White/60, Karlos Williams auto jumbo relic, and the top of the heap a Tom Brady Superfractor 1/1. No dups in 2 boxes so the colation seems to be OK.
Really enjoy the 2015 Finest. In the middle of breaking a sealed case (currently have opened 3 boxes of 8, all boxes posted on YouTube) and very pleased with the results so far. Through 3 boxes, pulled a Relic/Auto Sean Mannion Pulsar /35, Duke Johnson Jumbo Relic/Auto, MANY parallels of base (Tyler Lockett BCA refractor /25) and die-cuts, Pulsar Jordan Matthews 1995 Retro /50, Tom Brady 1995 Retro Gold parallel /199 and a Todd Gurley Refractor Variation auto /30. 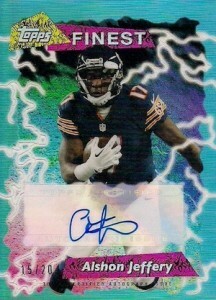 trey � The checklist on the site is straight from Topps so I guess it was just an omission. I added it. This is a solid product at the current price point of $80/box. You get 2 shots at a top rookie with the auto patches (although the best cards are definitely SPs). Nice design with some good colored refractors in each box. Unlike previous years’ releases, I received the number of 1995 designs and Atomic Die cut rookies specified in the sell sheet. 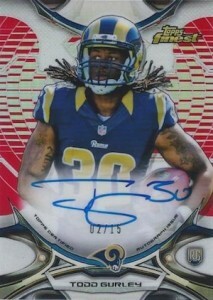 Plus the chance to pull a low numbered on card autograph. The rating on this site is pulled down due to the guy spamming about his bad luck. I feel bad for you man, but when you can just buy a Winston, Mariota, or Gurley RPA for a fraction of the price of one case, you should just purchase singles if they’re the cards your really want.